While most cultures in India don’t have a formal wedding cake cutting ceremony, a lot of young couples are choosing to have beautiful wedding cakes as a part of their celebrations! And to be honest, there are so many wedding cake designs out there that it may seem a bit overwhelming to finalise on the perfect wedding cake for your special day. To make your search for your wedding cake or engagement cake a little easier, I have curated a list of trending wedding cake designs that you can show your wedding cake baker for customisation. So, are you ready to scroll through some mouth-watering wedding cake images? If you want a beautiful wedding cake to match with your desi decor, then these Indian wedding cake designs are a great choice for you. They are bright, colourful and look absolutely delicious! Chandelier wedding cakes are a huge trend in 2018 and for all the right reasons. Suspended from a stand like a chandelier, this wedding cake design is cool and definitely unique! These designs are also great for your engagement cakes! If you are looking for a bright and vibrant wedding cake, then this colourblock wedding cake design is something that will surely catch your fancy. You can choose both of your favourite colours or stick to a colour palette to match you wedding decor colours too! “Couples who read together stay together.” I, for one totally love this wedding cake idea of having your and your partner’s favourite books on the wedding cake design. For foodie couples out there, you can simply mount all your favourite food on top of each other and make a crazy good wedding cake! Let all hell break loose. Add those fries, burgers, chocolates & pizzas that both of you love binging together! Drip cakes are a simple and elegant option that can be used as an engagement cakes too! Drip cake designs look better on small cakes, especially when decorated with wedding cake toppers! If you are having a daytime summer wedding in an outdoor setting or in a place surrounded by woods or greenery, then a rustic wedding cake is a fantastic option that will match with your decor too! If symmetry is something that fascinates you, then geometric wedding cakes are a great option for your big day! You can either choose a completely different shape for your entire cake, or simply use some geometric elements all over the cake. The trend of ombre colour shading is taking everything by storm. Right from dresses to hair colours, everything has ombre colours, so why should wedding cakes be left behind? 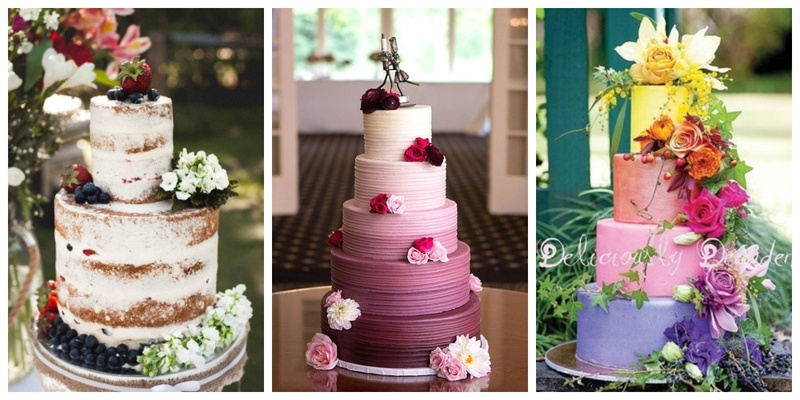 Well, ombre wedding cakes look colourful and elegant at the same time, no? Lace wedding cakes are a tasteful choice for couples who want to have a wedding cake design that’s simple yet graceful. If you are an art lover and appreciate a good painting or two, then these hand painted wedding cakes will definitely catch you eye. You can choose any painting that you love and ask your wedding cake baker to customise it for you. A little bit of shine and sparkle never hurt anyone, did it? Well, these metallic wedding cakes sure as hell stand out shiny and classy with their metallic accents and decoration. What do you think? Is there anything prettier than buttercream wedding cakes with a ruffled design? Well, it is a classic wedding cake idea that will never go out of style! Naked wedding cakes are a raging trend this year and I am definitely not the one to complain. These naked cake designs have minimal frosting and are generally topped with fresh fruit and decorated with small flowers! They are perfect if you have a penchant for things that are minimal yet classy! If you have an old school style, then these vintage wedding cakes in white will prove to be a graceful option to begin you celebrations with. This wedding cake idea is a great pick if you want to have different flavours in your wedding cake. All you have to do is pick a multi-tier stand and mount small cakes on each of them and decorate the entire setup in a similar theme. Are you having sugar cravings looking at these wedding cake designs already? Well, you can save the wedding cake pictures you love for inspiration and show it to your baker while they design your D-day cake!